Are you a friend of ice hockey, formula, skiing, athletics or soccer? And you want to see your favourite sport programs live and in good company. If you agree to the above, then Centro´s sport bar Roosters is the right place for you! We show the favourite sports of Finns in the new furbished room. Big screens allow us to show several programs at the same time. This makes it possible for you to follow your favourite team or sport. To make the shows even more enjoyable, we serve you food and drinks. You can choose from small snacks to bigger portions to fulfil your hunger. 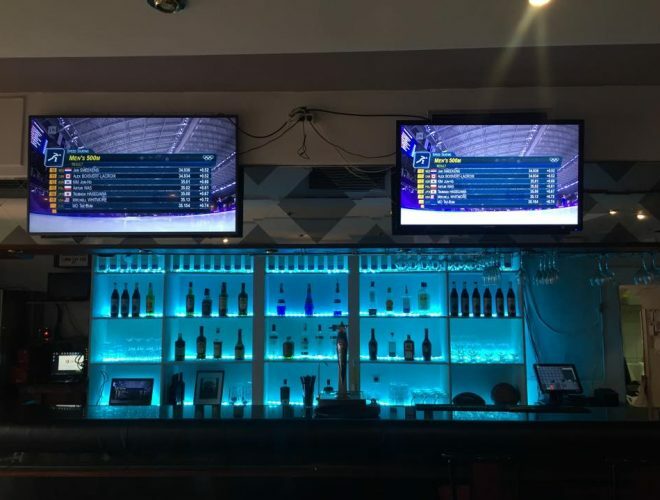 There is a large variety of Finnish beers to enjoy at the sport bar atmosphere, if you already have enough of the local beer offerings, which we also serve. At the Roosters you also have the famous Finnish Sauna. It is a terrific place to relax and enjoy the Löyly, steam that comes from the stones. There are public and private hours to choose from. The up-to-date and air conditioned Sauna area is a great place to arrange small happenings in the evening. Come to Sauna and enjoy!